'999 More Questions on the Rules' - an interesting way to obtain a better understanding of the myriad of Rules incidents that golfers regularly encounter. Click here. Every purchaser will also receive a bonus of a free copy of my eDocument, '99 Tips on Using the Rules of Golf to Your Advantage'. Total price; $10.99, or £7.99, or €9.99. 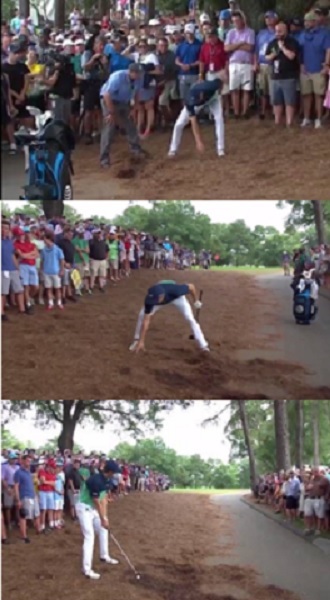 I would have thought that, as the ball would have come to rest on or in the pine straw had it ended up there rather than on the path, Spieth should have been told to drop the ball while the pine straw was still there and then, and only then, be permitted to move such straw that could be moved without disturbing the ball. Why was this not the ruling? Because loose impediments may be removed at any time, providing they are not from a hazard in which the player's ball is lying, Rule 23-1. So, players may always remove loose impediments from the area in which they are about to drop. Love your Blog, its so informative, thank you. My question is about walking off a course and DQ's or N/R's. 1. If a player walks off a course after 9 holes in an 18 stroke play competitions, is he disqualified? 2. If a player walks off after 9 holes in an 18 hole stable ford competition is the score for the first 9 his final score? Your questions are not Rules issues. Unlike the Rules of Golf, which are unified across the world, there are a range of different handicapping systems used by national golfing bodies and I do not have expertise in this area.